There is this movie group I am a part of which gives me my dose of which movies to watch and which to skip. There are instances where we end up discussing a director or an actor for days to end. And that is where I heard of this new tamil movie that had released last week - Goli Soda. What a name,right? I wondered what it could be about. And again I relied on the group to throw some light. All that I read was rave reviews about the kids who had acted in the movie and the director who had taken on such a subject and executed it brilliantly. A friend said "it stars the same 4 boys who acted in Pasanga".. I met her reply with blank stare because I hadn't watched the movie. And thus was born an impromptu plan to watch the movie. We booked tickets at PVR and were at there on time. The movie opens at Koyembedu Market with a bunch of kids running around unloading trucks and catching up on some sleep at odd hours. They get paid by a lady they call "aachi" and sit in the terrace looking at the girls who walk by to school. They have fantasies of romancing girls, talk about dates and make big plans. They go by their daily routine, but the only thing that plagues them is the lack of "identity". They don't have a family, no education, no home and all they do is work in the market. The lady asks them what their future plans are and if they plan to keep doing what they do and be nobody? This is what triggers them off and that is where Goli soda takes off as well. Aachi (Sujatha Sivakumar) takes them to meet Naidu (Madhusudhan), the president of the Market Association, a man who is respected, but above that is feared. He generously allows them the use of one of his shops at the market, which the boys convert to a small restaurant "Aachi mess" ubt then comes trouble in the form of Mayilu [Naidu's brother in law/ main man] who frequents the shop, starts drinking & smoking and goes all out one night by bringing in a woman there. That is when the retaliation begins, the fights, the harassment, the chaos and then the climax of this movie. The four boys - Kishore, Sree Raam, Pandi and Murugesh, and the 2 girls are the heroes of this movie!! Right down to the climax, the movie had us glued and wondering what is going to happen next.. It shows that strong dialogues or big lavish sets are not what makes a movie powerful, good dialogues and neat execution works magic!! The only drawback of the movie are the scenes with Powersta/Sam anderson and the background score... Wish the former had been done away with and the latter had been better...!! Kudos to Vijay Milton for taking on this subject and being true to the plot till the end.. It was something I had not done in ages, I was watching movies on the day of their release, and this was courtesy a friend who had an extra ticket and had sweetly remembered me! I watched Jilla 1st in Sathyam, Vijay's dad and few others from the movie where also in the theater [ya ya I saw them while I was waiting for my friend]. The movie is about a father and his adopted son, starts off like Sarkar where the duo rule the town going on to take on resemblances to Saami and then somewhere loses the entire plot to get twisted and knotted. To top it off, there were not one or two but nearly 5 songs within the 1st hour that had me cringing. Phew! I had survived that ordeal... yes literally come out not having killed anyone. 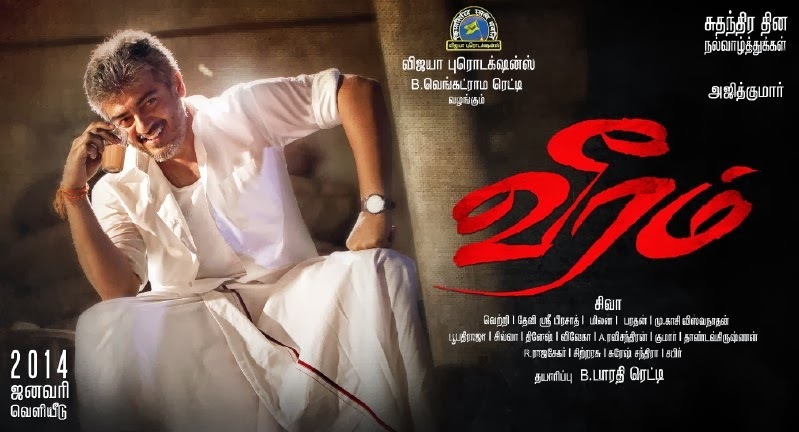 It was now time for the next movie of the season- Veeram, starring Thala Ajith. I had seen his earlier release Aarambham amidst milk abhishekam and what not, so was quite wary! This movie is about 5 brothers, yes, you read it right- Ajith being the eldest of the lot and there are 2 others who get a bit if screen time but the remaining 2 are there for what reason I wondered... Tamanna was much better when compared to Kajal Agarwal of Jilla. This movie also reminded me of the earlier Anandam featuring Mammotty as the eldest of 5 brothers [dont ask me why, I just remembered that movie]. It is about Ajith believing marriage will break their bond, but reality is that each brother apart from him have a lover on the side. So, they work hard at getting Ajith to fall in love so they can all get together with their partners.